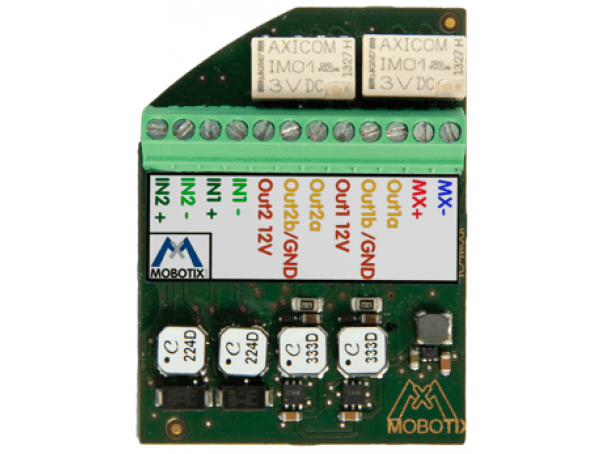 The MX-Bus-IO-Module is a practical, optional extension board for all MOBOTIX Indoor Cameras p25, i25 and c25, which is simply attached to the back of the camera and tightened (for i25 and c25) or mounted on the camera board (only with p25). The module expands every camera to include two extra inputs and two 12V outputs and enables access to the two-wire MxBus. 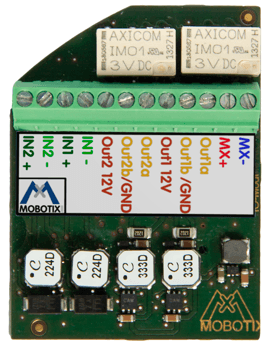 The outputs can be directly connected to a relay and thus higher voltages and loads, e.g., lamps or motors. MxBus is an encoded two-wire cable developed by MOBOTIX for transferring data and current. Using this solution, users can simply and securely power and control various MOBOTIX IO devices over distances of more than 100 m.